Alongside telescopes looking up into the night sky, the Royal Australian Mint launched its newest collectible coins at a unique event on Friday, 7 November 2008. The Mint joined with the Canberra Astronomical Society to create a night of star-gazing in celebration of the 2009 year set theme which commemorates the International Year of Astronomy (IYA). An amazing light show of local astronomer’s photography was also projected across the walls of the Mint building. "In 2009 the world celebrates the exploration of our universe. It marks the 400th anniversary of Galileo Galilei’s first use of the telescope and recognises his revolutionary discoveries that began modern astronomy," said Janine Murphy, Chief Executive Officer of the Royal Australian Mint. "Our world class coin designer Caitlin Goodall has designed two coins that not only reinforce the vision of IYA, but pay tribute to the important contribution Australia has made internationally in the fields of science and technology," said Mrs Murphy. The one dollar coin features an image of the famous radio telescope located in Parkes NSW, symbolic of Australia’s place in international astronomy. The twenty cent coin design makes a direct link with the vision of IYA; community involvement. This coin design features three stargazers observing the night sky. With the theme ‘The Universe, Yours to Discover’, the International Year of Astronomy 2009 is an initiative of the International Astronomical Union and is endorsed by the United Nations and UNESCO. Scouts from the local Mount Taylor group hosted a BBQ at the Star Party. Scouts Australia and the Mint have previously worked together to celebrate the Centenary of Scouts Australia with the release of a range of coins throughout the year. The Mint is open to the public from 9am to 4pm on weekdays, and 10am to 4pm on weekends and public holidays. For more information or to purchase this coin please visit the Mint (Denison Street, Deakin ACT) or alternatively visit www.ramint.gov.au, or call 1300 652 020. His Royal Highness, The Duke of Edinburgh, officially opened the Royal Australian Mint, Canberra, on Monday 22nd February 1965. The Mint was commissioned to produce Australia’s decimal coinage, which was to be introduced into circulation on 14th February 1966. The Royal Australian Mint holds a place in history as the first mint in Australia not to be a branch of the Royal Mint, London. Since opening in 1965 the Mint has produced over eleven billion circulating coins and has the capacity to produce over two million coins per day, or over six hundred million coins per year. The Royal Australian Mint has struck coins for a number of South Pacific nations. Export coins were first struck in 1969 for New Zealand and, since then, coins have been produced for Papua New Guinea, Tonga, Western Samoa, Cook Islands, Fiji, Malaysia, Thailand, Nepal, Bangladesh, Israel and Tokelau. 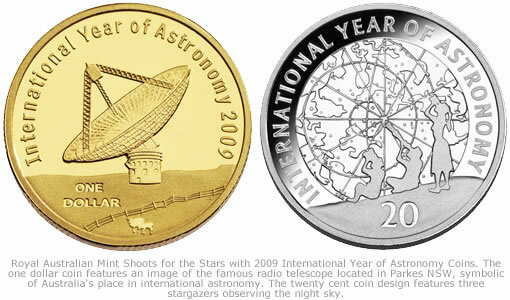 International Year of Astronomy Commemorative Coins come in 20 Cent and One Dollar Australian. It also come in 2009 Mint Set and Proof Set.